Video: Bauhaus: The Face of the 20th Century (approx 50 mins). Will squeeze into an earlier week as this week's full of tutorial presentations. 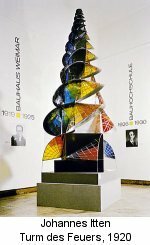 The Bauhaus was the first modern Art School. Before the Bauhaus, art education was a pretty generic affair - students would all copy the old masters until the 'got it right' - creativity was, if anything, discouraged. The Bauhaus was born in a country in turmoil - Germany between the wars. Mass inflation, the rise of Nazism and a widespread yearning for a former, mythical glorious history. 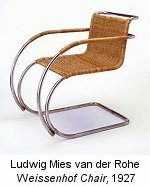 Perhaps a surprising time and place to be the cradle of modern design, but then extreme circumstances breed extreme responses of many kinds, and the communist, modernist approach of the Bauhaus accomplished a great deal in it's brief life. "The aim of the Bauhaus is the uniform work of art - the great building - in which there is no distinction between monumental and decorative art". Artists and craftsmen worked together on equal terms. The distinction between Fine Art and Applied Arts was dissolved altogether. The Bauhaus system mirrored medieval guilds in many ways. The professors were "Masters", the classes were "Workshops" and the students "Apprentices". Artistic direction was given by a "Form Master". 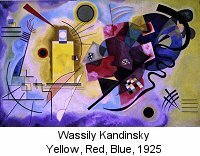 These included a number of well-known artists including Johannes Itten, Paul Klee and Wassily Kandinsky. "Craft Masters" were responsible for actual practical training in techniques. The Bauhaus was strongly influenced in it's early days by the Expressionist art movement. In 1923, Johannes Itten left the Bauhaus as he disagreed with the changing emphasis - the Bauhaus was becoming a factory for the production of manufacturing prototypes rather than a school of learning and innovation. 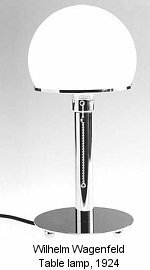 An example of this changing emphasis was in the metalwork workshops, where instead of fine silver art pieces, they were now designing and producing chrome-nickel functional pieces. 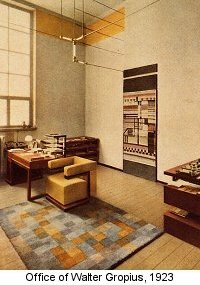 Bauhaus style transformed from expressive, with romanticised ideas of "true craft" and artistic individuality into an objective, collective form of design. Klee and Kandinsky guided the generic house style based on geometric components and forms based on concepts from Russian Constructivism. In 1925 the political situation led to the closure of the Weimar Bauhaus, but socialist local authorities in Dessau, a manufacturing area, offered to fund a new Bauhaus there. 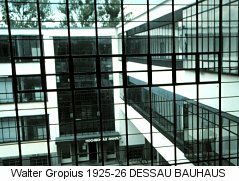 The Dessau Bauhaus, designed by Walter Gropius, opened in 1926. It still stands today, and was very advanced for it's time - it looks startlingly modern for it's time. 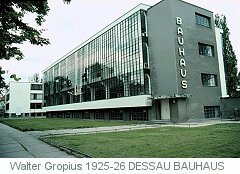 The Dessau Bauhaus was much larger and the emphasis was firmly on commercial prototyping for mass production. 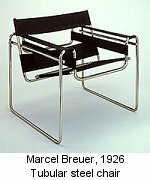 In 1925 the first tubular steel chair was produced, known as the "Wassily Chair". This led to a whole range of tubular steel furniture. Ludwig Mies van der Rohe became the last Director in 1930, and the school was finally closed by the Nazis in 1933. Many of the Bauhas designers moved to the US, where the legacy of Bauhaus design was key to the development of the modern "International Style". First Director of the Bauhaus, architect of the Dessau Bauhaus. Maker of the famous Wassily Chair. Several students are featuring Breuer's work in their tutorial presentations, so I won't put much here. 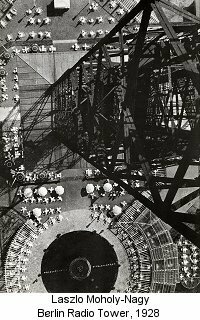 Director of the Bauhaus 1930-33, when it was forced to close by the Nazis. He then moved to the US and went on to become the leading architect of the International Style (more about him in that lecture). 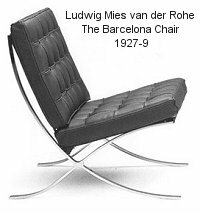 He designed a chair for the German pavilion at the Barcelona International Exhibition in 1929 that has become a classic of Modernist design. Photographer, artist, graphic designer. Ran the Foundation Course at the Bauhaus from 1923-28. 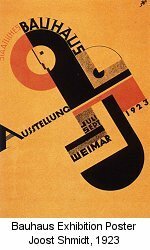 Wrote a book on the principles of typography called "Staatlicles Bauhaus Weimar 1919-1923". 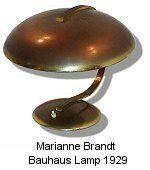 Designed some of the Bauhaus's most commercially successful items, such as lamps and tableware. One of the few female Bauhaus members to be allowed to work in the metal workshops. 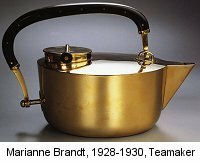 Well known for her elegantly geometric teapots, ashtrays etc. 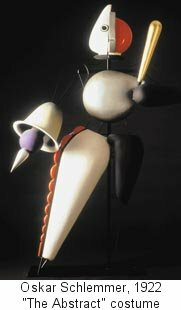 Stage Director and Master of Sculpture at the Bauhaus from 1923-29. Creator of the Triadic Ballet, a strange performance of simple choreographed movements with the dancers wearing huge, restrictive costumes in geometric shapes and symbolic masks. Germany had lost WWI. Mass inflation followed, and then the rise of Nazism. The Bauhaus was largely run by leftists, so it was a very difficult environment.